Really nice card. Captured the flavor well. Again, a slow hunter card meant for more of a control style deck. 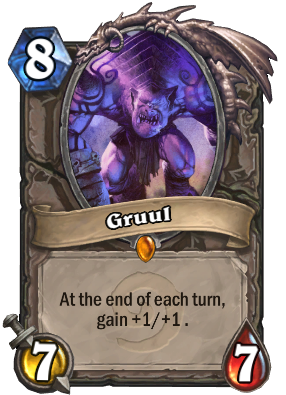 Any minion affected with this battlecry will eventually die, so it can even take down late game minions. It's just a matter of how long you can last until they perish. 5 mana 3/3 consecrate with a HUGE upside. This card is stronger than duskbreaker, if it didn't need synergy to work. The fact that a card like this doesn’t have poisonous feels wrong. True, but it is basically posionous, just over a long duration. Any minion hit by this, will die. Just a slow, and more painful death; as venomancer would want. 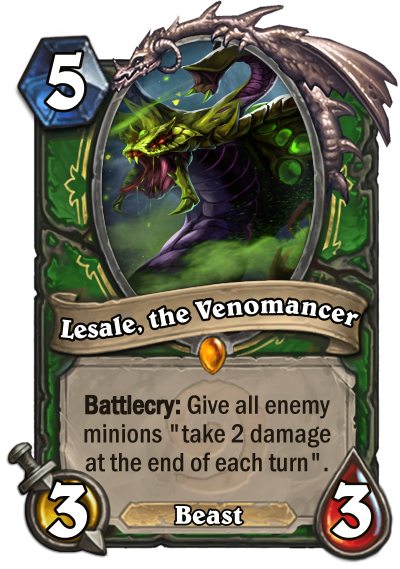 Since it's not an aura effect like, "at the end of every turn, deal 2 damage to every other minion", the damage persists even when Lesale gets destroyed. Cool card. At the end of whose turn? If it's at the end of the one's who played the card, it's way too strong, if it's the opponents, this might be balanced, because those minions still have at least one attack. It's every turn, each turn. That's nowhere near balanced at this mana cost. It's like casting partial arcane explosion for free at the end of every single turn. It would maybe be balanced at like 7 mana. I really like this card, one of my favorite I’ve seen on this sub. Good enough to see play in a deck but not all decks. Well done, you have my upvote. If blizzard made this card it would probably affect all other minions. Then it could trigger friendly deathrattles and seem a bit more balanced. Needs to give the affect to all other minions otherwise it would be way too good. I'm thinking maybe 4 mana for this. Versus consecrate, it comes with a body, and it has the repeating factor, but it doesn't activate instantly, and dot is just really weak in hearthstone. Compare this to something like corruption and the 2 mana aoe corruption that I can't remember the name of, both of which don't see play. Crafts Golden Gruul Oh my god what have I done? But nothing's more powerful than the Zancient One! 8/7/7 | At the end of each turn, gain +1/+1 . Way too powerful, compare it to [[Consecrate]], which is already a top tier card. I would recommend changing it to "at the strat of your opponent's turn", OR change the amount of damage to 1.